When Marc and I got married, quite a few of our friends bought or made us some amazing gifts. In amongst those gifts were some vouchers for a local recording studio, Catalyst Studios in St. Helens. 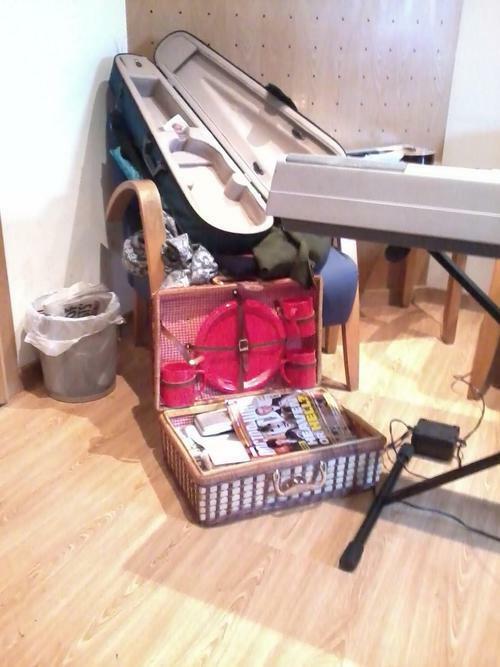 On the last Saturday in October we boarded a taxi with all our instruments and made our way down to the studio. I was slightly nervous; Marc and I had been in a studio together (not Catalyst) just once before and the sound engineer there had presumably been so cautious not to offend that he didn’t give us any idea how our song sounded, or offer any advice. Marc’s been in many bands and many studios before, but this was only my second time, and I was hoping that this time we’d be given just a little more direction (whilst not bossed around or told what to do and what not to do). I need not have worried! Andrew, who runs things there, was marvellous (especially as he had to tread a fine line between explaining things very clearly to me whilst simultaneously not appearing patronising to Marc)! He was really helpful at giving us guidance on what sounded okay and what might need another attempt, but was also absolutely fine if we wanted to change something a little. We took a break in the middle of the day for a picnic (I’d made butties and a cake). My son joined us half way through the day after spending the morning with his dad. It’s fair to say he was a little bored but we’d brought along reading material, pens and pencils, paper, and even a DS which he played until his eyes got tired. He couldn’t understand why we kept going and singing very similar things over and over again so I had to explain the concept of harmonies! 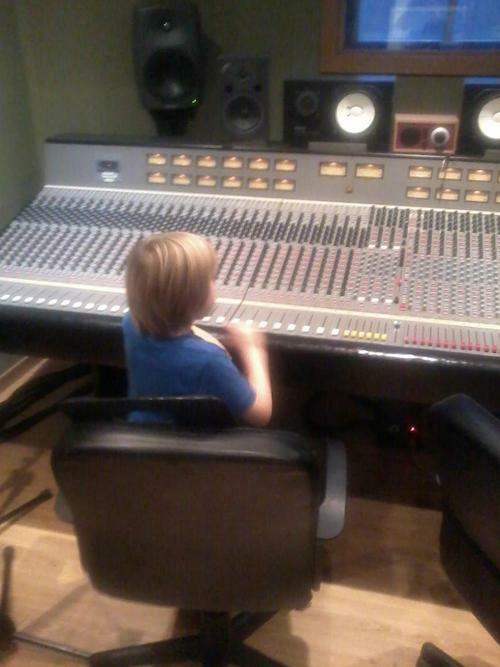 Still, he got to sit at the mixing desk. We’d originally hoped to go in for a day and come out with a ludicrous number of songs. In the end, we came out with two with which we were really happy, with lots of harmonies and various parts. Compared to our last visit to a studio, where we came out with a song in a matter of two hours, but much as it’s lovely, it sounds more like a live take, we were very pleased with the results at the end of our session. What would we do differently? Well, next time we go (and that’s a reminder to me… I need to sort this out!) we won’t sandwich it into a busy weekend of gigs. We did practise our parts of course, but they could have been even tighter. Also, I wrote harmonies for one of the songs literally the night before, and gave myself one or two notes that were too high for me to sing, due to me writing them at half eleven at night, knackered, and thinking “C#6? NO problem!” Of course, though I’m okay with A5 provided I’ve had a couple of cups of tea and it’s not first thing in the morning, and can even just about manage C6 at a push, with a clear wind in the right direction, that extra semitone? Nooo. Between that, and (me, not Marc, he’s blameless!) deciding to change a glockenspiel part at the last minute, I do think there was a bit of time that we wasted which with hindsight, could have been saved. Andrew was also a great help with the violin part. I’m a very average violinist (grade 5; can’t get more average than that) but with a very good violin (hired from Mike Phoenix and kindly sorted out by boss band The Loungs with a little help from The Heart of Glass - long story, and more about that in later posts) and some studio magic, I think the string part actually sounds great! One of the two songs we recorded was an original Christmas carol, and you can listen to it and download from Bandcamp. The other will be included as part of a future release. We would absolutely recommend Catalyst Studios to any musicians who want a professional recording of their music. We’ll be going back there anyway!